The Avengers International Fan Forum :: View topic - Steedumbrella - the first Russian site. Posted: Thu Aug 06, 2009 5:38 am Post subject: Steedumbrella - the first Russian site. Welcome to Stidambrella. The first Russian-speaking site devoted to an English serial the Avengers. The idea to create the given site has arisen during recent time, because of limitation of project Wikipedia where the page devoted to Avengers could not find room for all information necessary for this large serial. But in due course I will try to give to pages the necessary web-characteristics convenient for any user. There is a guest book. I ask to love and favour. Well done! I don't read Russian but it looks good! Why does 'Peel' only have three letters in Russian, by the way? Great work, with sites in English (USA, UK and Australia), French, German, Spanish, Dutch and now Russian the Avengers are become more promoted ever more on the web. Let's hope it will produce many new fans. I advise to take advantage of the professional translator of language: from Russian on English. I hope you will open for myself a lot of new Steedumbrella in the world. I'm impatient to see what the show looks like in Russia. Okay, well I love the intro, really with that snow on the pic. That's beautiful ! But I'm a little bit lost after that, I don't speak Russian. Well done and good luck to the people behind the Russian site! At Steedumbrella added section fan-art. Interesting photos of our heroes created in photoshop. Additional: I found a website Google archive interesting info. 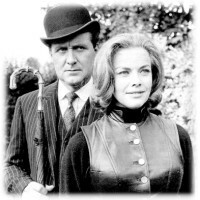 It turns out in 1989, television producer Diane Morgan had planned to rent a 4-part miniseries biography of Blind in one ear Patrick Macnee. Exciting. When found it will add a link on this page. On the Internet there is an interesting interpreter of various languages. In the case of translation from Russian to English - you copy the source text in the upper window, select the language under the windows, push button and is ready to transfer. I've had dreams like pic two. Transfer of page of a site of Steedumbrella by means of translator PROMT TRANSLATOR. If there are errors - excuse me. Favourite episodes of a serial Avengers — Too Many Christmas Trees and Death at Bargain Prices. At school-academy of drama art of Webber Douglas studied together with Angela Lansbery. At the Eton school - Hamphry Littlton, Saimon Fipps and Michael Bentin was on friendly terms with Ludovic Kennedy. At the age of 8 years for the first time left on a school scene having played Henry V. The Same statement became the first and for known actor Christopher Lee. In 13 years has played queen Victoria. In 9 years has taken part in the next statement with Christopher Lee on a school scene, having played Brutusa in Shakespeare July Caesar's play, Whether at that time when played Kassiusa. The next years they often appear together both on a scene and at cinema. There lives in the Palm-springs, California since 1969. Also has the house in San Diego. Does not touch alcohol since February, 12th, 1983. Though as he said he has ceased to drink after an episode Death at ocean of a serial of Colombo of 1975, nevertheless "green snake" sometimes did not give it rest, especially throughout a serial New avengers. Does not love a golf, hats and ties. Loves classical music, in particular Schubert, plays tennis, from cinema prefers films with participation of Hamphrey Bogarta. Favourite actress Ingrid Bergman. Favourite actor Edward G.Robinson. At the age of 3 years has started to go to the kindergarten Summer fields located near to Oxford. According to Patrick the Canadian radio has helped it to train a professional voice and helped on record of several audiobooks in 90. Its voice sounds in several teleserials. Favourite mark of the car — the Jaguar. The most interesting that when in a serial Avengers it was the owner of cars 20-30 years, in a life it had a green Jaguar of the sample 60. Later, on one of models, it drove about in a serial New avengers. Till now it is its most favourite car among others taking place in a serial. Jud Law — the actor who according to Patrick well would look as John Steed in a film Avengers. Mel Gibson is Patrick's great admirer also a serial Avengers. Became the grandfather in 1988. As the most successful work in the career considers theatrical performance of the Sleuth. The cousin of known television conjurer David Nixon. Whether in the childhood has been enamoured in actress Vivien Leigh. Has arrived in a drama school of Webbera Douglasa according to the advice of actress Margaret Roulings. I Read well, but here I write with errors. The text of the translator has corrected in places, I hope now more or less. Thanks you friends. That's the best laugh I'll get today! To explain it would be to spoil it, but I'm shaking with laughter! Has checked up again on Promt translator, all is exact. David Nixon. Not David Niven - erroneous opinion. Happy New Year from Moscow!!! I wish this year 2010 clemencies and pleasures. I have started to translate into Russian the Avengers episodes. Five episodes are at present ready. There are interesting facts earlier not published. Management of pages is carried out by means of arrows. HURRA!!! RUSSIAN SITE OF THE SERIES AVENGERS OF "STEEDUMBRELLA" IS AGAIN OPENED AND NOW ON THE NEW HOSTING! HAS APPEARED NEW GUEST - THE WHOLE SEPARATE SITE. Great job! I can't read it, but the pics are beautiful and the site looks lovely. This thread is great entertainment. I haven't laughed so much since Ambassador Brodny threatened Mrs Peel with his famous "Khaminski hammer-lock".